The second Selector Festival in Krakow, an electronic/dance event, took place over the first weekend of last month, following the resounding success of last year’s debut festival. A month of continuous rain had put paid to the original plan of having the festival on the Błonia again, which was more of a lake than a venue, so the airfield near Nowa Huta was chosen as back-up, its concrete air-strip flood-resistant if not perfect for the dance kids to chill out on; bright blue circus tents also slightly detracted from the festival feel, even if they provided cover. Over-zealous policing and a no-cash, festival credit card-only policy gave a rather controlled feeling to the event, but at least the sun had come out; the 2010 must-have fashion item, the colourful welly, was out in force anyway. The first night had a low-key look on paper, and as Friendly Fires took to the stage at 7 pm a modest but appreciative crowd had assembled to see this English electro band with a burgeoning reputation. Their itchy, infectious, almost Balearic brand of dance music – 80s in an ABC kind of way – drew a good response, and when singles “Skeleton Boy” and “White Diamonds” were played, beefed-up on stage by the presence of a bassist, two drummers and a sax player, their fans responded warmly. “Can you dance to a slow song?” inquired lead singer Ed Mcfarlane, before playing a song that was conspicuously not slow at all – the new single “Running Away” – slinky as a coiled spring. An hour of boogie-tastic electro pop ended all too soon, but thankfully it was only an hour before Thievery Corporation hit the main stage. Orbiting around genius DJ/producers Rob Garza and Eric Hilton, Thievery Corporation’s touring band numbered somewhere in the range of 15 musicians, including two drummers, a sax and trumpet horn section, a bass player, a guitar/sitar player and a series of vocalists from places as far-flung as Tehran, Buenos Aires, and Guyana, singing in at least four different languages. Their set, lasting well over two hours, was like a musical travelogue. They transported fans through the Caribbean and into South America, across the sea into Africa and further into the Middle East, and further still into India, all the while maintaining a taut thread of trance. And they played these pieces as if they had transformed into classically trained, native musicians from each region. Transcendent and entrancing, they stole the show on this first night. That’s not to say that Calvin Harris didn’t have a stormer as well; the by-now sizeable crowd went absolutely wild for his set, tracks “Acceptable in the 80s”, “I’m Not Alone” and “Ready For the Weekend” in particular. This Scottish electro-popster knows how to rouse a crowd, and as his first album, entitled I Invented Disco, hints, he doesn’t lack ambition. The only disappointment on the first night was the once-great but now uninspired Audio Bullys, who put on a limp set to a nevertheless uncritical crowd to round the night off. The Saturday evening was noticeably better attended, understandably because Faithless were headlining. Delphic were the first band on the main stage, and they played a note-perfect set, their New Order-y sound drawing another sizeable crowd, and kicking off the evening nicely. “Doubt” has the feel of something off Technique, and “Acolyte”, “This Momentary” and “Clarion Call” all showed that this young Manchester band is bursting with talent – transferring their studio sound to a live setting almost too well is the only slight criticism. That criticism could not be levelled at Metronomy. From start to finish, they whipped the crowd up to an absolute frenzy. The “Pigbag”-like two-and-a-half-minute keyboard stomp “On the Motorway” set the band up for a set that had the floor shaking for 90 minutes. Again, the band had opted to flesh their electronic sound out with bass and guitars, and this paid off handsomely. “Heartbreaker” was a four-minute piece of pop perfection. Clad in black with light boxes around their necks, Metronomy’s sound is part Cure, part Bloc Party, part Kraftwerk, and when they play “You Could Easily Have Me”, the sound explodes and the crowd goes wild. Along with the choreographed dance moves they pull – though nothing more than fist-pumps and chest-banging – their songs have a human quality and a humorous edge, which many of their peers lack. The stage, then, was set for Faithless. And they did not disappoint. 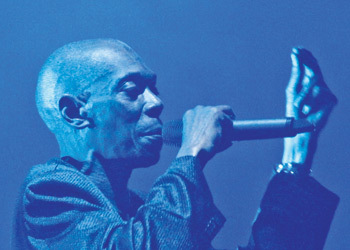 Despite going quiet in the last few years and suffering some critical mauling for their recent albums, Faithless showed exactly why they are still considered masters of this indie/dance genre. The night’s festivities began with “Happy”, a vibrant track from the new album, but it’s not until Maxi Jazz – as charismatic as ever throughout – announced “This is my church” three songs in that the feet really begin to move and detach from the ground. “God is a DJ” is one of those Faithless tracks even your gran will know, and it’s one of a handful of iconic singles around which the set list was shaped. At the halfway mark, “Insomnia” proved another of these moments and its centrepiece solo synth riff was met with one of the most rapturous audience reactions I’ve ever witnessed. In between the big-hitters, newbies from the album – such as the soulful, Blancmange-sampling “Feel Me” and comeback monster “Not Going Home” – intertwined with other memorable moments from the back catalogue, including a fiery and especially gratifying “Weapons of Mass Destruction”, resulting in a rounded set that brought the party to Krakow and was never at a risk of losing the attention of the adoring crowd. There followed an ecstatic two-song encore, which culminated with a six-minute version of “We Come 1”. Clearly moved by the rapturous reaction, Maxi Jazz, hand to heart, finished with, “Thank you from the bottom of my heart – there is a lot of love in this room. Go out and spread it around Krakow tomorrow”. This was his church. And on a night like this, even I believed that God might just be a DJ.